Roseola is a common childhood disease. The cause is primary infection with human herpesvirus 6 (HHV-6). 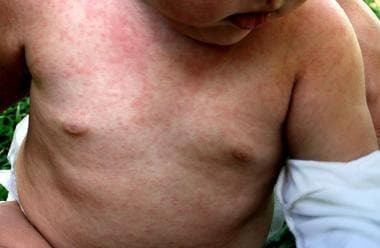 The classic presentation of roseola infantum is a 9- to 12-month-old infant who acutely develops a high fever and often a febrile seizure. After 3 days, a rapid defervescence occurs, and a morbilliform rash appears (see the image below). Roseola infantum. Image courtesy of Wikimedia Commons. Like other herpes viruses, HHV-6 then remains latent in most patients who are immunocompetent. Although clinical disease is uncommon in patients who are immunocompetent, HHV-6 is a major cause of morbidity and mortality in patients who are immunosuppressed, particularly in patients with AIDS and in those who are transplant recipients (eg, liver transplantation [1, 2] ). In the primary infection, replication of the virus occurs in the leukocytes and the salivary glands. HHV-6 is present in saliva. A study monitoring HHV-6 and HHV-7 DNA in saliva samples during the acute and convalescent phases demonstrated a significantly higher rate of detection in children aged 3-9 years versus adults, suggesting that children in the convalescent phase of roseola infantum are the more probable source of infection. Early invasion of the CNS is believed to occur, thus accounting for seizures and other CNS complications. Evidence suggests that high serum levels of matrix metalloproteinase 9 and tissue inhibitor of metalloproteinases 1 in infants infected with HHV-6 may lead to blood-brain barrier dysfunction, which may result in febrile seizures. Study of cerebrospinal fluid levels of interleukin 1β and basic fibroblast growth factor may indicate a role in contributing to HHV-6B growth and the onset of encephalitis. Although rare in the primary disease of infancy, generalized organ involvement has been reported with gastrointestinal, hematopathic syndromes; hepatitis; and hepatosplenomegaly. Following the acute primary infection, HHV-6 remains latent in lymphocytes and monocytes and has been found in low levels in many tissues. Peripheral blood mononuclear cell cultures develop enlarged balloonlike cells. Cells supporting virus growth are CD4+ T lymphocytes. HHV-6 down-regulates the host immune response through several mechanisms, including molecular mimicry by production of functional chemokine and chemokine receptors. The two variants of HHV-6 are A and B. The genomes of HHV-6A/B have been sequenced. HHV-6B, the main cause of roseola, consists of 97 unique genes. CD46 is the cell receptor for HHV-6, which imparts the virus' broad tissue tropism. A possible association of HHV-6 and multiple sclerosis has been suggested but is still inconclusive. HHV-6 has been isolated in Kaposi sarcoma (caused by human herpesvirus 8), in which it may contribute to tumor progression. HHV-6 may facilitate oncogenic potential in lymphoma and has been associated with chronic fatigue syndrome. The causative agent of roseola infantum was discovered in 1986. The Roseolovirus genus of the beta herpes virus hominis subfamily contains human herpesvirus (HHV)–6 and HHV-7. HHV-6 has 2 variants: HHV-6A and HHV-6B. Their major differences are cellular tropism. Debate has existed whether they represent 2 species. HHV-6A infection is rarely associated with roseola infantum. HHV-6A is associated with infection in adults who are immunocompromised. HHV-6A infection occurs later in life, and details are lacking. HHV-6B is the cause of roseola in infants. Because seropositivity is nearly 100% in older children, most primary infections with HHV-6B are asymptomatic. HHV-7 has been identified in a few cases of roseola infantum. Recurrences of roseola infantum are not common. A well-documented case of a 13-month-old child who had a second episode of roseola exists. In the acute phase of the second episode, HHV-7 was identified and excreted in the saliva. This was followed by excretion of HHV-6. Serologic tests indicate that human herpesvirus 6 (HHV-6) infection is nearly universal. In emergency clinics, HHV-6 has been reported to be responsible for 10-45% of cases of febrile illness in infants. A 2005 population-based study revealed primary HHV-6 infection cumulative percentages of 40% by age 12 months and 77% by age 24 months. The peak age of acquisition of primary HHV-6 infection is 9-21 months. International studies show some variation in worldwide seroprevalence. A strong association of HHV-6A in Zambian children with febrile illness suggests an endemic hot spot. With rare geographic exceptions, no racial differences seem to occur in HHV-6 infection. Practically all patients who are immunocompetent survive roseola infantum without sequelae. In patients who are immunosuppressed, multisystem complications are not unusual. Infection may be chronic, leading to viral progression and death. Primary infection with HHV-6 may be asymptomatic, or it may cause the exanthem subitum/roseola syndrome. Within that complex, otitis, gastroenteritis, respiratory distress, and seizures may occur. Primary infection in infants is rarely complicated by serious disease and is very rarely fatal. Case reports of many organ systems being involved indicate a potential morbidity, although this is rarely observed. The second stage of HHV-6 infection occurs in healthy children and adults. The virus replicates in the salivary glands and is latent in peripheral blood mononuclear cells. A form of latent infection is found in the integration of the virus in host chromosomes. In adults who are immunocompetent, infection or reactivation of HHV-6 is rare. These few patients have been reported to have lymphadenopathy, hepatitis, and a mononucleosislike syndrome. In patients who are immunocompromised, a more serious disease is seen. Transplant recipients (eg, marrow, kidney, liver) may have marrow suppression, pneumonitis, encephalitis, hepatitis, fever, and an eruption. Organ rejection and death may occur. Studies of these patients are complicated by frequent concomitant reactivation of human herpesvirus 7 (HHV-7) and cytomegalovirus. HHV-6 was implicated as the cause of 30% of cases of pneumonitis in patients who underwent bone marrow transplantation. Patients with AIDS comprise the second at-risk group; however, antiretroviral therapy has reduced morbidity. HHV-6 infection in patients with AIDS results in viremia, lymphadenopathy, disseminated organ involvement, active CNS infection, retinitis, and death. HHV-6A is more common in patients with AIDS than in other patients. In the case of an otherwise healthy infant with roseola infantum, educating the parents is important to alleviate anxiety about the hyperpyrexia and possible associated seizure. In patients who are immunocompromised, the complexity of overlapping signs and symptoms with other viral syndromes and parasitic and fungal infections must be explained. For patient education resources, see the Children's Health Center, as well as Skin Rashes in Children. Vinnard C, Barton T, Jerud E, Blumberg E. A report of human herpesvirus 6-associated encephalitis in a solid organ transplant recipient and a review of previously published cases. Liver Transpl. 2009 Oct. 15(10):1242-6. [Medline]. Abdel Massih RC, Razonable RR. Human herpesvirus 6 infections after liver transplantation. World J Gastroenterol. 2009 Jun 7. 15(21):2561-9. [Medline]. [Full Text]. Miyazaki Y, Namba H, Torigoe S, Watanabe M, Yamashita N, Ogawa H, et al. Monitoring of human herpesviruses-6 and -7 DNA in saliva samples during the acute and convalescent phases of exanthem subitum. J Med Virol. 2017 Apr. 89 (4):696-702. [Medline]. Kittaka S, Hasegawa S, Ito Y, Ohbuchi N, Suzuki E, Kawano S, et al. Serum levels of matrix metalloproteinase-9 and tissue inhibitor of metalloproteinases-1 in human herpesvirus-6-infected infants with or without febrile seizures. J Infect Chemother. 2014 Nov. 20 (11):716-21. [Medline]. Tamai M, Kobayashi N, Shimada K, Oka N, Takahashi M, Tanuma A, et al. Increased interleukin-1β and basic fibroblast growth factor levels in the cerebrospinal fluid during human herpesvirus-6B (HHV-6B) encephalitis. Biochem Biophys Res Commun. 2017 May 6. 486 (3):706-711. [Medline]. Zerr DM, Meier AS, Selke SS, et al. A population-based study of primary human herpesvirus 6 infection. N Engl J Med. 2005 Feb 24. 352(8):768-76. [Medline]. Vianna RA, de Oliveira SA, Camacho LA, et al. Role of human herpesvirus 6 infection in young Brazilian children with rash illnesses. Pediatr Infect Dis J. 2008 Jun. 27(6):533-7. [Medline]. Magalhães Ide M, Martins RV, Vianna RO, Moysés N, Afonso LA, Oliveira SA, et al. Detection of human herpesvirus 7 infection in young children presenting with exanthema subitum. Mem Inst Oswaldo Cruz. 2011 May. 106(3):371-3. [Medline]. Razonable RR, Lautenschlager I. Impact of human herpes virus 6 in liver transplantation. World J Hepatol. 2010 Sep 27. 2(9):345-53. [Medline]. [Full Text]. Ward KN. The natural history and laboratory diagnosis of human herpesviruses-6 and -7 infections in the immunocompetent. J Clin Virol. 2005 Mar. 32(3):183-93. [Medline]. Ward KN, Andrews NJ, Verity CM, Miller E, Ross EM. Human herpesviruses-6 and -7 each cause significant neurological morbidity in Britain and Ireland. Arch Dis Child. 2005 Jun. 90(6):619-23. [Medline]. Higashimoto Y, Ohta A, Nishiyama Y, et al. Development of a human herpesvirus 6 species-specific immunoblotting assay. J Clin Microbiol. 2012 Apr. 50(4):1245-51. [Medline]. [Full Text]. Stone RC, Micali GA, Schwartz RA. Roseola infantum and its causal human herpesviruses. Int J Dermatol. 2014 Apr. 53(4):397-403. [Medline]. Rapaport D, Engelhard D, Tagger G, Or R, Frenkel N. Antiviral prophylaxis may prevent human herpesvirus-6 reactivation in bone marrow transplant recipients. Transpl Infect Dis. 2002 Mar. 4(1):10-6. [Medline]. Medscape Drugs & Diseases wishes to recognize Stephen W White, MD† for his original contributions to this article.